‘The Beast from the East’ has arrived at just the right time for us. Half the roof is missing and we haven’t even one wisp of loft insulation. Last night we packed everyone off to bed early, layered up in thermal vests under their pyjamas. Every hot water bottle and blanket we own was put to good use. This morning dawned bright and freezing, not a snowflake in sight. If it had been the weekend I’m not sure any of us would have bothered getting up. As it was we gingerly tested the air outside the covers with single toes, then counted to three before leaping for dressing gowns and slippers. Here is a hot steamy rainforest scene to warm you up on this cold morning. 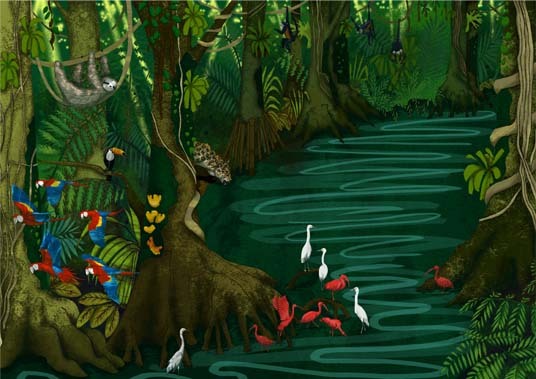 This entry was posted in Illustration, Wildlife and tagged blankets, bracket fungi, builders, buttress roots, children, crows nest fern, ecology, education, egret, epiphytes, green, Hannah Foley, hot water bottles, illustration, illustrator, jaguar, king palm, loft conversion, macaw, natural history, prop roots, rainforest, red, roof, scarlet ibis, science, slippers, sloth, spider monkey, stag horn fern, strangler vine, the beast from the east, toucan. Bookmark the permalink. I just love all the detail in this & the colours are gorgeously vibrant. Take care with that roof missing. Hope it gets put back on pretty quickly.